“How do vegans get protein?”is a popular question that meat-eaters tend to ask, and by now, vegans are probably sick of hearing this question. When an individual thinks of a vegan, they think of the poster child for all vegetarians, a skinny hippie with dreads. Did you know Al Gore, Alanis Morissette, Bryan Adams and Ricky Martin are vegans? Yet, based solely on their looks, you could never guess this – obviously, they’re getting their right amount of protein. 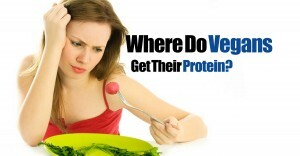 Before we tell you how vegans get protein, we are going to explain why protein is needed. Proteins are needed, because they are a responsible part of making up the cells in the human body, from your blood transport molecules to your hair. If an individual does not have the proper amount of protein in their body, they can lose muscle mass, suffer from weakened heart, immune and respiratory systems and have problems growing. Proteins are made of amino acids. Yes, the body is able to make some amino acids on it’s own, but these are what we call non essential amino acids. Essential amino acids are the ones the body cannot make on its own, you have to eat proteins in order to receive these. On a daily basis, the human body needs between 0.8 to 1 gram of protein for every kilogram of body weight. So, if you are 150 pounds, you’ll need a total of 55 grams of protein on a daily basis. So, moving on, how do vegans get their protein? Non-Dairy Milk: 1 cup of almond milk has between 7-9 grams of protein. Combine almond milk with fortified cereal, you’ll have a vegan-friendly breakfast high in protein. Vegetables: Greens, such as spinach have a pretty nice protein punch. For example, spinach has around 7 grams of protein, while one cup of boiled peas has a total of nine grams. Beans: While some people try to stay away from beans, vegans need to steer towards them, because in the vegan world, they are the ‘magical’ fruit. One cup of black beans contains 15 grams of protein. Peanut Butter: Simply by consuming 2 tablespoons of peanut butter, you will receive 8 grams of protein. If you’re not too fond of peanut butter, you can eat cashew butter or almond butter. Tofu: Tofu is pretty good, as long as it is made right and most of all, it is packed full of protein. Seeds: This is another great vegan food source. Most seeds contain protein. Omega-3 and omega-6 fatty acids. For example, 1 serving of sunflower seed contains a total of 23 grams of protein. Come to think of it, most of the foods consumed by vegans contain protein. In all reality, regardless of who you are, eating healthy is a challenge. There are plenty of options available for getting your daily protein.